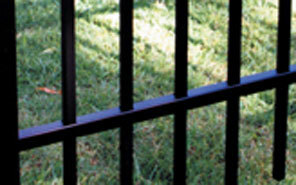 We offer ornamental fencing in both aluminum and steel types. Each type is available as mechanically fastened as well as a welded option for added strength and security. Each type comes in Residential, Commercial and Industrial Grades. 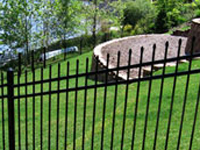 Residential Grade Aluminum Fencing has been designed for use in residential settings. It is commonly used around homes to provide property boundary definition, to contain pets, and to provide a level of security. 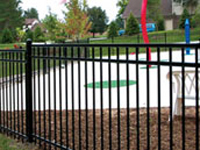 Residential Grade Fencing is also commonly used for pool safety and can be designed to meet pool code requirements. Residential fence panels come pre-assembled in “six foot” sections with 1″ X 1″ horizontal channels and 5/8″ X 5/8″ pickets. Standard picket spacing is 4 1/2″ on center providing 3 7/8″ air space between pickets. Standard colors of Black, White, Bronze, Green, and Beige are available at no additional charge. Adornments are available in gold color. Custom colors are available at an additional charge. Commercial Grade Aluminum fencing has been designed for use in high-end residential settings and for commercial settings. It is commonly used around high-end homes and around businesses to provide property boundary definition, to contain pets, and to provide a medium level of security. 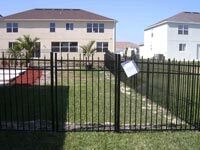 Commercial Grade Fencing is also commonly used for pool safety and can be designed to meet pool code requirements. Commercial fence panels come pre-assembled in “six foot sections” with 1 ¼” X 1 ¼” horizontal channels and ¾” X ¾” pickets. Standard picket spacing is 4 5/8″ on center providing 3 7/8″ air space between pickets. Standard colors of Black, White, Bronze, Green, and Beige are available at no additional charge. Adornments are available in gold color. Custom colors are available at an additional charge. Industrial Grade Aluminum fencing has been designed for use in commercial and industrial settings. It is commonly used to achieve high visibility property boundary definition and a high level of security. Industrial Grade Fencing is a heavy grade of fencing and has been designed to withstand above-normal abuse and to act as a deterrent to trespassers. Industrial fence panels come pre-assembled in “six foot” and “eight foot sections” with 1 ½ ” X 1 ½ ” horizontal channels and 1″ X 1″ pickets. Standard picket spacing is 4 7/8″ on center providing 3 7/8″ air space between pickets. Standard colors of Black, White, Bronze, Green, and Beige are available at no additional charge. Adornments are available in gold or color. Custom colors are available at an additional charge. 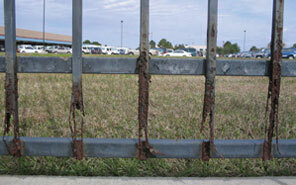 Welded aluminum fence is available in commercial and industrial grade materials. 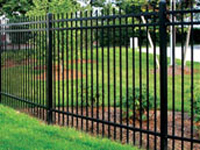 Welded aluminum fence is used in the same applications as residential, commercial, or industrial mechanical fence. Welded aluminum fence is stronger and more customizable than mechanical fence. Commercial grade sections are pre-built in six-foot and eight-foot sections with 1 1/4″ X 1 1/4″ punched horizontal channels and 3/4″ X 3/4″ pickets which provide 3 3/4″ air space. Industrial grade sections are pre-built in “six foot” and “eight foot sections” with 1 ½ ” X 1 ½ ” horizontal channels and 1″ X 1″ pickets, and also provide 3 3/4″ air space between pickets. Standard colors of Black, White, Bronze, Green, and Beige are available at no additional charge. Adornments are available in gold color. Custom colors are available at an additional charge. Rose also has the ability to provide custom water-jet logos, symbols, and custom designs thanks to our in-house drafting and design department. All aluminum products have a powder-coat finish and come with a limited lifetime warranty on the finish. We sell and install a welded, rackable, solid line of ornamental steel fence by Ameristar Fence Products. Please review the products below. 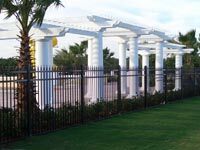 We are also able to provide Ameristar’s full product line of ornamental steel and aluminum fence and gates in residential, commercial, and industrial grades. 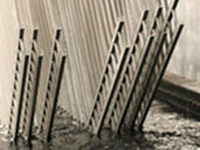 E-Coat Submersion Application: Galvanized steel framework is subjected to a multi-stage pretreatment/wash (with zinc phosphate), followed by a duplex cathodic E-Coat system consisting of an epoxy primer, which significantly increases corrosion protection, and an acrylic topcoat, which provides protection necessary to withstand adverse weathering effects.